She lambasted the Trump International Hotel & Tower, which appeared over her left shoulder as she delivered a 30 minute speech, as “a shrine to greed, division and vanity” and accused Trump of putting his name on every building. 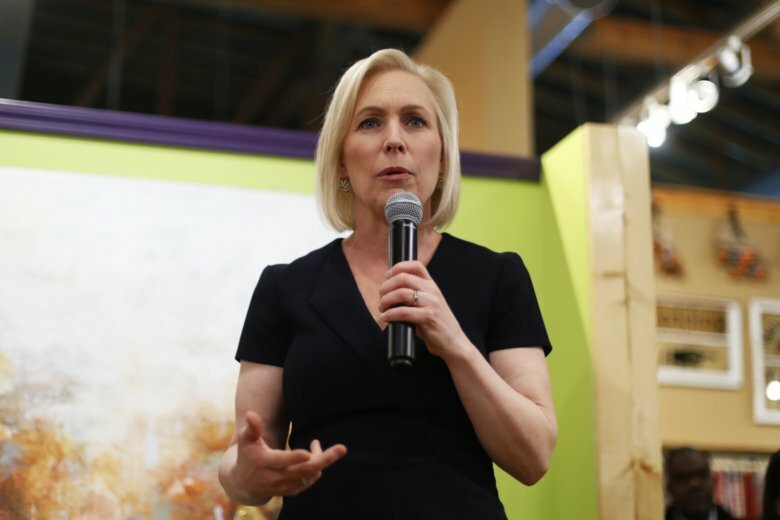 Though Gillibrand first said that she was exploring a presidential bid in January, the New York speech was her first since formalizing her efforts last week. It seemed an attempt by her campaign to position Gillibrand in the crowded field of Democrats seeking the party’s nomination, a field in which she has been looking to define her path. While Attorney General William Barr released a summary of principal conclusions on Sunday, hours after Gillibrand’s Manhattan speech, she is among the Democrats calling for the full details. While some Democrats have taken steps to avoid mentioning Trump on the trail, Gillibrand has not done so. And her decision to re-boot her campaign outside of one of Trump’s signature policies, showed her willingness to go after Trump directly. Aides to Gillibrand though dismissed the notion that the choice of venue was crafted to provoke a retort from Trump. While the president and his campaign have not responded to Gillibrand’s speech, a handful of Trump supporters were on hand Sunday, carrying Trump 2020 banners and at times piercing through the speech of Gillibrand and others with chants. The event, which took over a portion of Central Park West on a chilly Sunday, focused on a theme of bravery. That theme first appeared in the video she released announcing Sunday’s rally. She was joined onstage by more than a half-dozen activists, including young people who were brought to the United States illegally as children, survivors of sexual assault, and anti-gun violence advocates. In the crowd, a woman sold pink, knit hats with cat ears, recalling the Women’s March. Gillibrand was introduced by the actor Connie Britton, who lived with Gillibrand when the two studied abroad in Beijing.